Well it's been a while since we did a book review! I must say I did get a lovely load of books last Christmas, it's been a joy ploughing through them over the winter months! So here is a share of my favourite one! 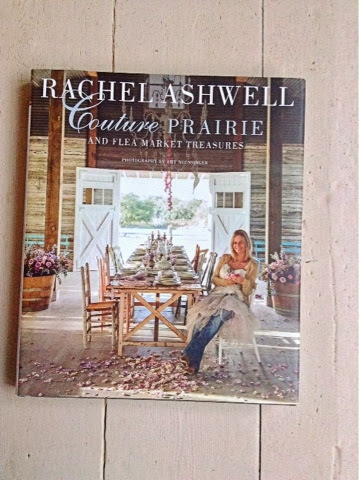 Couture Prairie by Rachel Ashwell. Well here goes, this beautiful book is much more than a coffee table read, it's an inspiration! Here, the queen of shabby chic, Rachel shows us around her gorgeous, luxuriously shabby B&Bs. Lovely old barns and fabulous rooms, set in Texas. The feel is opulent with a paired back style of fadded grandeur in an effortless shabby prairie style! Every page turn is a swoon of fabulousness, with gorgeous faded fabrics, old furniture in its naturally shabby style with old paint in beautiful tones gently chipping off! All the rooms are furnished with an abundance of sumptuous bedding in Rachel's beautiful range of fabrics. Her statement colour pallet of chalk pink, white and a hint of blue and grey give a calm feel and a natural flow throughout all the buildings! The section on the flea market finds is simply stunning! And I just want to go! Anyway, I could go on for pages but I won't! If you love shabby chic and gorgeous stuff then go and buy this book! You really won't be disappointed!